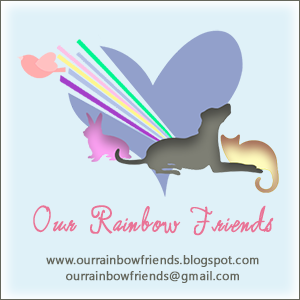 Rainbow Bridge Remembrance Day is a special day dedicated to honoring the memories of those beloved pets in our lives we have loved and lost, but never forgot. Whether a pet with fur, fin, feathers, scales, or something else - one pet, or many - the day was created for pet guardians to honor the pet in any way that feels most comfortable to them. Post a picture, write a poem, share a favorite memory, upload a video, or write a special blog post and share the link. A special event page will be set up on Facebook for Rainbow Bridge Remembrance Day for those who care to share pictures, poems, videos, tribute memories, links to blog posts and more. Feel free to visit and post to this special page on August 28.
in tribute to her Ragdoll cat, Mr. Jazz, who she had to say goodbye to on August 28, 2013. She shared the journey of letting him go in her critically acclaimed book, Purr Prints of the Heart - A Cat's Tale of Life, Death, And Beyond and decided to create the day in his honor as a way for others across the world to share memories of their own pets they had loved and lost. Thank you for this beautiful badge. I'll put the day on my blogging calendar.